Moonlight Basin is part of Big Sky Resort in Montana, as Big Sky’s Northern Exposure, part of the 5,800 acres and four mountains of terrain. There’s a cool story about how Moonlight came to be: two Montana ranch hands buy up 39-square miles of logged land and turn it into a ski resort. Moonlight Basin opened in 2003 with 8 lifts (including “the six- shooter” 6-person chairlift), a fabulous log lodge and spa with cascading outdoor pool, and regal but rustic mountain homes throughout the Montana resort. 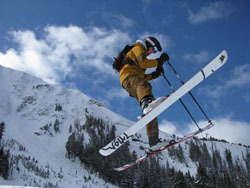 What do ranchers know about skiing? For one, location is key. 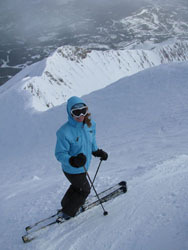 Moonlight Basin is the northern face of famous Big Sky Resort, and for years the two ski resorts shared a lift, The Iron Horse quad, and offered an interconnected lift ticket. In 2013, Big Sky Resort acquired Moonlight Basin and now its one ticket for four mountains, 300 trails plus glades bowls and chutes, 5,800 acres and 34 lifts. That’s greater than Vail (5,289), or Alta/Snowbird (4,700) and nearing Whistler Blackcomb (8,100) and Park City (7,300). The Moonlight Basin side has its own members-only lodge and real estate community, though the skiing is open to all ticket and passholders. During a family ski trip to Big Sky, we stayed in the Moonlight Basin area for a few delightful days. Moonlight’s 2,200-acres of protected north facing terrain (on the backside of Big Sky’s 11,166’ Lone Peak) offers groomed undulating cruisers, an ideal Pony Express family area, and upper mountain Lone Tree quad where we discovered dozens of snow stash glades, and bowls that remain fresh long into a powder day. Moonlight’s Headwater double chair climbs the steep flank of Lone Peak serving nothing but ATL NFT (above tree line, no fall terrain). For us, Fire Hole was crazy and exciting with must make turns as we descended a narrow corridor full of soft snow. We enjoyed Moonlight’s soft snow and pure solitude, particularly as we skied past massive mountain homes, most unoccupied. Moonlight is like a private club with posh lodging to match, akin to the nearby Yellowstone Club, only less pricey. 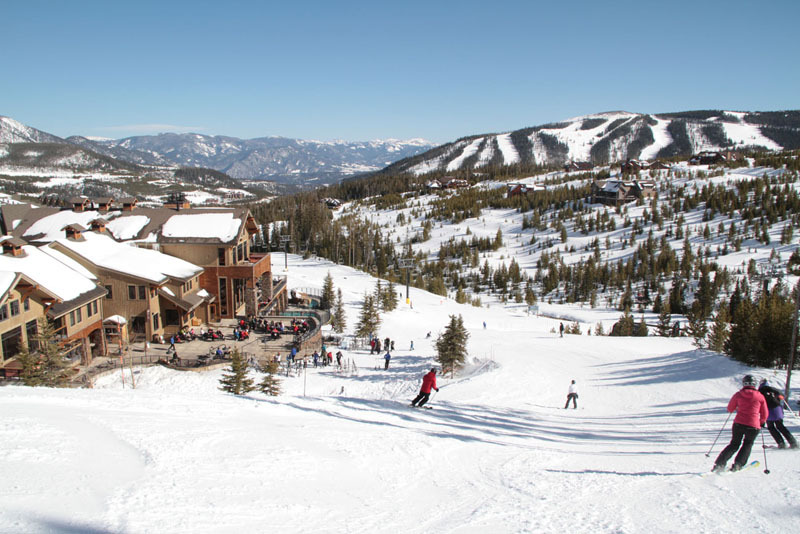 Montana’s 16 ski areas combined get less skier visits than Breckenridge Colorado alone. Moonlight’s lack of lift lines is evidence of that. Big Sky brags about 2 acres per skier – a roomy stat for sure. Its the best freedom, skiing over to yet another huge Montana ski resort, Big Sky, and enjoy these lifts and more well groomed terrain from quieter Moonlight. It is a very European style ski experience, having so much terrain and no borders to cross or lift ticket checks. One big blue sky day at Moonlight, we skied over to Big Sky, rode the 15-passenger Lone Peak Tram up to the looming 11,166’ summit where the air is thin and the views are breathtaking as far as the Grand Tetons. After the required sign in with Patrol, we ventured off the North Summit Snowfield (in timed intervals to prevent avalanche danger). Not since Zermatt have I skied such out of bounds, out of this world terrain. North Summit Snowfield is 4,000’ vertical run on spectacular summit snowfields leading to the steep chute of Great Falls, to wide open Deepwater Bowl, then glades and groomers back to Moonlight’s base. My knees were shaking, my heart pounding, and my teeth were showing from a huge grin. This Lone Peak ski adventure is for experts only (insert skulls and cross-bones here). 500 acres in The Moonlight Basin area is scoped for future ski terrain. Now that Big Sky and Yellowstone Club have acquired Spanish Peaks and Moonlight Basin from the former rancher who started Moonlight, Lee Poole, and Lehman Brothers who’s financial issues were a roller coaster for the ski resort, I expect great things for this great ski resort. A new base village at the Madison Base with a hotel are in the rumor mill. I also expect Big Sky Montana will be discovered by more and more families looking for a special western ski destination. Après ski at Moonlight Lodge – if you are invited to this private club memberhisp lodge – is a perfect ending for an epic Montana ski trip. As the last light cast over the slopes, we soaked in the stunning steamy outdoor pool where waterfalls cascade over native rocks. Inside the magnificent timber lodge, (ranchers know how to do beautiful post and beam), we had drinks by the crackling fireplace which is so big that Billy goats are perched on the huge rocks above sumptuous leather couches. Moonlight Lodge is now private for members and guests only, what a privilege, we dined on trout and bison in a relaxed rocky mountain setting. We suggest you giddy up to Montana, ski Big Sky.